Remember the days when you were young and you went to the carnival? 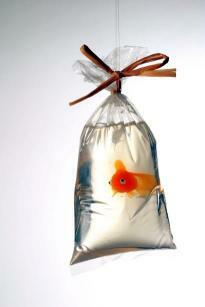 Everyone always won a little goldfish and took them home in a bag of water. Well here is our rendition of this magical childhood memory. 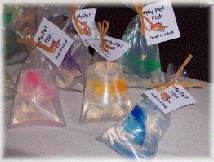 A generous 5 ounces of crystal clear hypoallergenic glycerin soap with a small plastic fish embedded into it so children get a prize for getting clean! Just peel off the bag and soap as usual. When your soap is all gone, you have a fish to swim with! Assorted colors; colors may be limited. Keep extras on hand - make great stocking stuffers! The more you buy, the more you save.